Being a freelancer surely is diverse and interesting, but due to considerable competition succeeding is not easy. 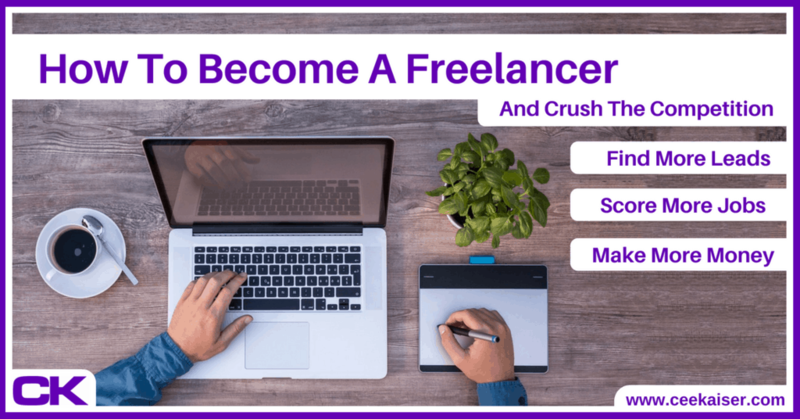 Whether you want to be a copywriter, photographer, virtual assistant, web designer, programmer or anything else – the following article is your key to successfully become a freelancer and be ahead of the rat race. The true beauty of freelancing is being your own boss and working location independently. Read on to turn this dream into reality. Learn how to beat the competition, generate more leads, score more jobs and eventually make more money by working less. Becoming a freelancer can help you design your dream lifestyle today – no need to wait for retirement. 4 A Freelancer’s Competition. And How To Beat Them. The demand for freelancers has seen an incredible growth over the past decade. Busy business men are trying to free up a little space in their jam-packed schedule to increase their life quality. Companies of all sizes need flexible, yet capable support. Even private people are looking for helping hands at times. The easiest way out is outsourcing to freelancers. The demand is high and growing, and, so far, there are no signs of a market saturation. Of course, in a capitalistic society, growing demand usually dictates a growing supply. Be prepared that there is quite a bit of competition out there. Especially landing your first jobs will not be as easy as telling Chang and Bintang beer logos apart. As the internet allows to hire freelancers from all over the planet, and most freelancing portals require little to no verification to sign up to, your competition can be as old or young as they want. Their circumstances may allow them to charge rock-bottom prices. Hence this article also covers how to avoid price wars. The easiest way to win a price war is to not show up. Despite the multitude of competitors, there is a very high demand for professional and trustworthy freelancers, and the remuneration clients are willing to pay per hour for outsourcing their worries can go into the three-digits. What you need to ensure to get there is to be exactly that: Professional and trustworthy. First of all, set up shop on one or two social media platforms, then fully automate them – for free. Next step is to build your own website to showcase your skill portfolio and references, and make sure you are reachable via various communication channels as constantly as possible. In case you don’t have a website yet, create one first, as the success of your freelancer career depends on it. It doesn’t have to be perfect to start with, but it needs to be up and running. I have never hired a freelancer for any project above 20 USD value without having checked their website. Note: Once your website is live, read through these 9 ways how to make money online. A side hustle never hurts. All you need is that said website. The first step to becoming a freelancer is certainly to be sure of your decision. Do you have a passion for the skills you want to offer? Are you fine to work under pressure and with fixed deadlines? Can clients reach out to you in emergencies? If you can answer these three questions with a firm ‘Yes’, then you should continue reading. In case you are unsure, maybe research the internet once again to get a better idea of what being a freelancer implies, and get experiences from people who have walked the walk. Including all this information in this guide would certainly go beyond the scope of this article. But before you get all lost talking to experts for the next two years, just get into it and give it a shot. What’s the worst thing that can happen? Related: Responsibilities of a location independent freelancer. A Freelancer’s Competition. And How To Beat Them. Give your competition a quick thought. There are thousands of skilled professionals out there that are happy to work for very low salaries – a Filipino with an excellent command of English might charge as little as 5 USD an hour. And that is exactly why you need to be different. Why you need a professional website and a well-structured email newsletter system. 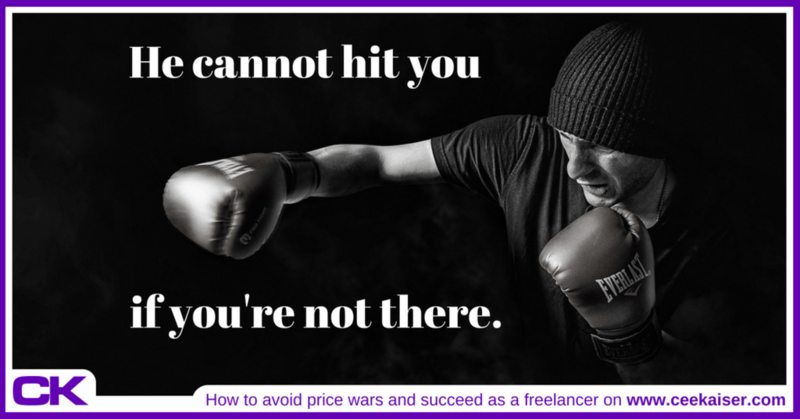 Don’t try to compete on prices with other Freelancers. It will not make you happy, nor get you closer to the location independent lifestyle you are aiming for. Compete on professionalism. Go the extra mile. Set up a website that showcases potential clients at the very first glance that there is no smarter choice than you. Then send them an email newsletter series that’ll convince them to basically outsource their entire life to you. Deliver outstanding service, build up trust, then slowly increase your rates. Once you are invaluable to your clients, they will happily pay to retain the freedom you offer them. Specializing offers two main advantages: On the one hand, your clients know you are an expert in your field. On the other hand, you know exactly who to market to. Both points are extremely valuable and will give you a huge advantage over your competition. 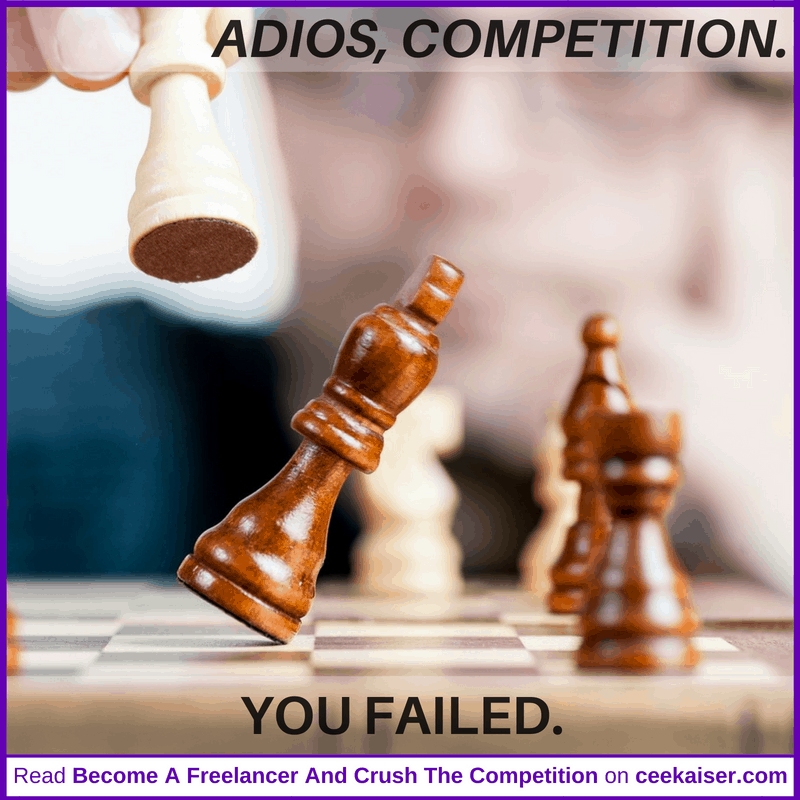 That’s how celver freelancers win price wars before they even started: By avoiding them. Finding first clients is the most difficult task of all. Once you got your freelance marketing machine running on autopilot, job offers will follow. But the beginning is extremely hard, no point in sugarcoating that. One highly efficient opportunity many freelancers overlook to score remote jobs is marketing themselves offline. Since ‘remote work’ is often associated with ‘online job’, few people take their marketing efforts into the analog world. Make use of that! Talk to people. Explain to them what you do. Better even, explain to them what you can do for them. Tell them about how you will make their life easier and free up their time. All they need to do is send you some payments. It is the exact same sales strategy we explain in the email campaign section below, but offline. It is an incredibly obvious step, but very free freelancers take it. Be different. It pays. The next obvious step to finding first clients as a freelancer is becoming part of as many freelancing portals as you consider necessary. In fact, one single outsourcing portal could be enough for the beginning, if you work it thoroughly and actively pitch your skills to people. Note: We recently updated the article on How and Where to get Location Independent Jobs For Freelancers, where we discuss the best pitching strategies, explain how to avoid price wars and evaluate all major freelancing portals from a freelancer’s point of view, including their pros, cons and costs. Take a look – it’s worth it. Also, sign up for our newsletter “Thursday Thoughts”, where we regularly share the best hacks on how to be location independent and successful. As you will quickly find out, payment via freelancing portals is usually not great. And it doesn’t have to be. The idea is to gain some experience, collect a few references for your website and find clients that are interested in working with you on long-term projects. Once a cooperation is established, communication and payment moves outside the freelancing platform, which significantly increases your margin. Nonetheless, make sure you never sell yourself at less than fair value, even at the beginning. Sure, you cannot expect 3-figure hourly rates from the get-go, but neither should you apply for projects that pay a dollar a day. Be aware that in most cases scoring a project includes quite a bit of (unpaid) upfront communication with the client, so please do yourself a favor and factor this in. Also, as in the best case you are looking to build up long-term co-operations, check if someone is looking for ‘one off logo design’ or rather ‘ongoing email support and content creation’. Pitch your thoughts, and make sure to follow up on it! Seriously: If you don’t hear back after two days, don’t be shy, shoot them a quick message to check whether they received your pitch or not. This single message will make you stand out over 95% of your competition already! Make sure to send it. And yes – if the project is worth it, send a third and fourth message as well, if need be. Don’t be shy. In case they already hired someone else for the project, they can at least send you a short note on that. Following up shows your potential employer that indeed you are keen, and that you are professional. If you follow up on their sales calls as consistently as you do on your own pitch, they can be assured to see their sales stats rise skywards. So don’t be shy or feel bad about it. In the very worst case, you don’t get the job, which you didn’t have to start with. So what have you got to lose? You know, you come from nothing, you’re going back to nothing. And then the job offers start coming in. When negotiating with a potential new client, make sure to offer them the full range of your spectrum. However, since decision processes usually take a little while, you do not want to overload them with information in the very first message. Build up some trust, move communication from the freelancing platform to direct email, and then drip all your skills one by one right into their inbox. To get started, note down all the skills you have and would like to offer, then get to work and create an automated email workflow. Let’s say you are a virtual assistant and your skill portfolio comprises answering customer-relations emails, hand-crafting and sending out birthday gifts, comparing specifications of consumer electronic goods, completing databases as well as professional in-depth information research for academic articles. Of course you want to offer every single skill to every single potential client. Even when at the beginning they only look for a hand (or even two) to answer their clients’ emails, there is a very high chance they do need help with at least one of the other tasks you can offer as well. Make sure to really offer everything to everyone. Spell things out. Don’t expect anyone to know what you are capable of. This holds true for every possible freelancing position. In case you are a copywriter, don’t just say ‘I can create content’. Enlist in detail what you can do: Write blog articles, draft PR snippets, create marketing slang for flyers, redact their website and craft newsletters. They want to save time. You want to make money. If you are a photographer specialized on food photos, make sure to break this up into small, relatable jobs. Breakfast buffet in the restaurant, Lunch by the beach, afternoon tea in the garden and candle-light dinner under the stars can all be completely separate projects, all of them earning you just another fine salary. Don’t cram all your skills into one email, because it will get overlooked. Spread it out over several emails, detail out what you can do, enlist the benefits to the employer and attach work samples where available. Even if the email recipient doesn’t need all your skills right then, maybe their friends or colleagues do. And once you have built up trust, it will be an easy pitch to have them recommend you to others. We don’t know how many freelancers you have worked with yourself so far. However, from our experience we can tell you that we never ever met a single freelancer who used automated email workflows to promote her services. As professional marketers, we really cannot understand how you can let such an incredible opportunity pass you by! Emails are the most efficient amongst all free marketing strategies for startups and freelancers! Unless, of course, you are totally swamped with work. But then it’d simply be time to raise your prices and earn more per hour to work less in total. And then still send out automated emails. Email newsletters set you apart from the competition entirely. And they can be fully automated. You set them up, they work for you, and they can make you a lot of money and save you a lot of time. Every day, every night, all year round. As you know, the competition is out there, waiting for you to make a mistake so they can take over your clients. With email newsletters, you turn the tables on them. Setting things up will roughly take you a day or so, but afterwards all processes are completely automated. All you need to do is take on projects, successfully complete them and rake in the dollars. Then proceed to the advanced marketing strategies for freelancers explained towards the end of this article. Select your favorite email marketing program (these three are completely free of charge) and open it. To exemplify, we will use the winner of those three, MailerLite, going forward. First, set up a new group in the ‘Subscribers’ section called ‘New Leads’. Then head over to the ‘Automation’ tab and create a workflow for ‘New Leads’. The workflow trigger is, of course, when someone joins that new group. Toast to the birth of your new workflow! Create an initial welcome email, introducing yourself and giving your lead an outlook on what to expect. Make sure to keep things general enough so you can send it to pretty much everybody, but personalize it enough to arouse the idea that this email was specifically crafted for the recipient. To look professional and not like a spammy newsletter, we recommend to simply create a plain text message. No fancy graphics or animations – unless you’re a designer or photographer, maybe. Pure, plain text, explaining to the point what you want to get across. If you do opt for HTML / graphics, keep things simple. Less is more. And, of course, highlight the option for your recipient to opt out of the workflow. It can save you a lot of trouble. In case you are that virtual assistant mentioned above, hired for content creation, your welcome email could be something along these lines. In case you are not, sure you can figure out how to adjust the text accordingly. This is Clare, your new freelancer, ready to take on some of your work load and free up some time in your schedule. My skills comprise a wide field of tasks, including email management, data research and hand-crafting birthday gifts. I will happily introduce each skill in a bit more detail to you over the next few weeks, and explain to you how I can save you several hours of work every week (if not each day!). I know your schedule is busy, so my emails will be to the point and only be sent once a month. If you do not like to receive them, please simply click here. Of course, if at some stage you have questions, feel free to reach out to me at any time. I am looking forward to working with you, Jeff! Note: Should you ever decide to call yourself a freedom fairy, we do expect a hand-crafted birthday present from you as well. This email gives Jeff a perfectly short overview on what is coming up, and might make him hungry for more. That is why you should highlight in the email what your skills do for him – which is saving him time. You could also put emphasis on how boring database management is, or how annoying the always recurring same questions from clients can be, and how happy you are to take all this away from him. He’ll love you for it. In case he is not interested in any of the mentioned skills, he may of course unsubscribe, and neither of you has lost anything. It’s always worth a try. Note: In case you have too many people unsubscribing on your initial email, try to rephrase it, make it shorter or add more skills to the list. Generally, the more skills you enlist, the likelier it is that a prospect gets interested. And, even in case they do unsubscribe, they have gotten another reminder of what you can do for them. Sure one or the other will get back to you about this at a later stage! After the introduction, you of course shouldn’t let Jeff hanging until he forgot about you. You promised him further information, so you need to deliver. The handy thing about Workflows is: You set them up once, and then forget about it. So MailerLite takes over your work, and basically becomes your Freelancer. Nonetheless, you don’t want to spam him either. He is already a busy person, otherwise he wouldn’t outsource tasks to a freelancer. As most likely you are in touch with your employer anyway regards the project you were hired for, we recommend one or two automated emails per month. Try that to start with – you can always adjust later. With MailerLite, you can time your emails, so they are only sent on certain days. In case you mainly work B2B, the most efficient days to send emails are Tuesdays and Thursdays, so make sure you make use of that feature accordingly. B2C clients might also have time on weekends to sift through their inbox. Feel free to test different approaches. Also, MailerLite offers the handy feature to automatically re-send emails in case they were not opened. 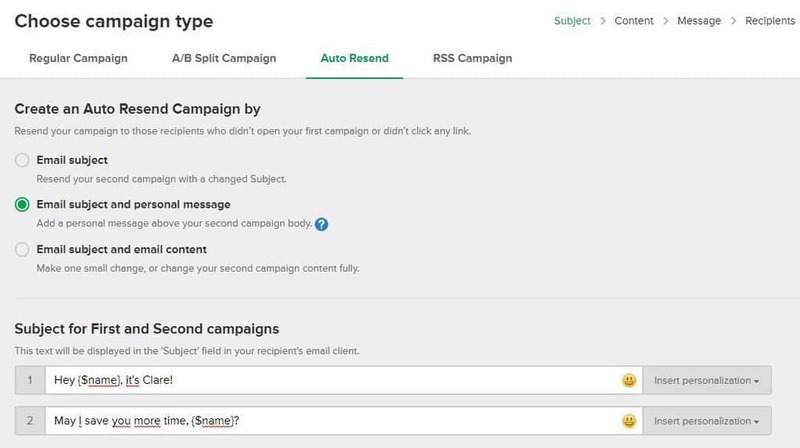 When creating a new campaign, simply select the ‘Auto Resend’ option. In case your recipient does not open the initial email, he’ll receive the same email again a few days later. Change the subject line and add a personal message, stating “Hey, you missed my email, but I know the content is of value to you, so here it comes again.”. This feature alone has proven to increase opening rates by 20-30%! The second email should already be a highlight. Possibly the skill you want to promote most, the one you know will save your client the most time, or the one that yields your highest margin because you are so exceptionally good at it. In the very best case, these three are the one same skill. Make sure to phrase your email accordingly and maybe add an example of how many hours you saved another client. Marketers call this ‘social proof’, and it works wonders. Don’t lie, don’t exaggerate, but calculate a feasible example and send it through. It will open up your leads’ eyes on what you can offer them. In the end, you will have a workflow with between 3-10 emails that can be sent fully automatically to any person you assign the tag ‘New Lead’. Sweet. Besides the automated email workflow, you may of course also use your email contacts to send ‘standard newsletters’, e.g. informing them about a new skill you acquired or about a special promotion you run. The ‘new skill’ newsletter should be self-explanatory. We sincerely do hope you keep learning and educating yourself. Surprisingly, we never ever received an email from a freelancer stating that now they do offer HTML coding in addition to their existing skill portfolio. Nor have we received any newsletter stating anything similar. We do not know why. Apart from offering new skills, there are times when you need extra cash quickly, or currently have a few spare hours to fill before embarking onto your next exciting destination. Why not send a special promotion to your client database, maybe offering one hour free on top of every 10 hours booked and paid within the next week? As a freelancer, you are a business. So market yourself like businesses do. Start Making Money with MailerLite Today! Once you have set your autoresponders and scored the first clients, we recommend to create separate pages on your website for each of your main skills. On these pages, briefly explain what you will do, why you are better at this than everybody else, highlight the benefits for your clients, offer some examples of how other people profited from your help, and add some social proof (e.g. quotes from former clients) to each page. Once that is done, edit your workflow messages and include links to your pages. Whenever clients are interested in that skill, they can visit your page to receive further information. This gives you valuable insights on what people are interested in. Also, in case the vast majority clicks through to your website coding skills page, but doesn’t book, maybe you want to review the page structure, your pricing chart, or send an honest email to everyone who has clicked the link to openly ask why they did not book in the end. Note: As the headline says, this is advanced. Don’t worry about this within the first six months of becoming a freelancer. Focus on finding clients and gathering experience first. Then come back here and take things a step further. Bookmark this page for easy reference. Once you fully want to automate your lead nurturing, you can think about generating extra workflows for each tag you assign. In case a lead does get tagged with ‘database management interested’, send her another two to three emails, emphasizing how boring databases are, and how we could all fill our lives with more fun things. However, databases are of course crucial to business success, and someone needs to keep them up to date, and you are more than happy to do this dull task for her. Then go hire some freelancers yourself, because this will increase your client database and conversion rate substantially. People want to outsource their life, but to someone professional enough to do it the way (or even better) they would do it themselves. Make sure to position yourself as the expert they cannot live without. Then, finally, send us a Thank You message for sharing all these insights with you. Or let your freelancers do that for you. One hack lots of freelancers often overlook is asking for feedback. Whenever you completed a job, ask for feedback, specifically for one single thing you can improve on. In case the feedback is good overall, ask your client to provide a short statement you can use as testimonial on your website. Collecting reviews on Freelancer sites such as Upwork, Freelancer and Fiverr is good. But pulling testimonials together on your website is key, as you never know if one of those freelancer platforms decides to shut down. Your website is the only space where you have full control of your data and reviews, so make sure to make use of it. Want to learn more killer hacks on how to make more money and score more clients? Or have some sensational insights to share? Then either drop a comment below or join our Facebook discussion to network with like-minded people. It is a great place to exchange ideas and jointly solve issues. Also, you can find freelancers that pass on some of their work due to being overloaded with projects. So get connected!